One of the joys of photographing weddings is enjoying the beautiful flowers. 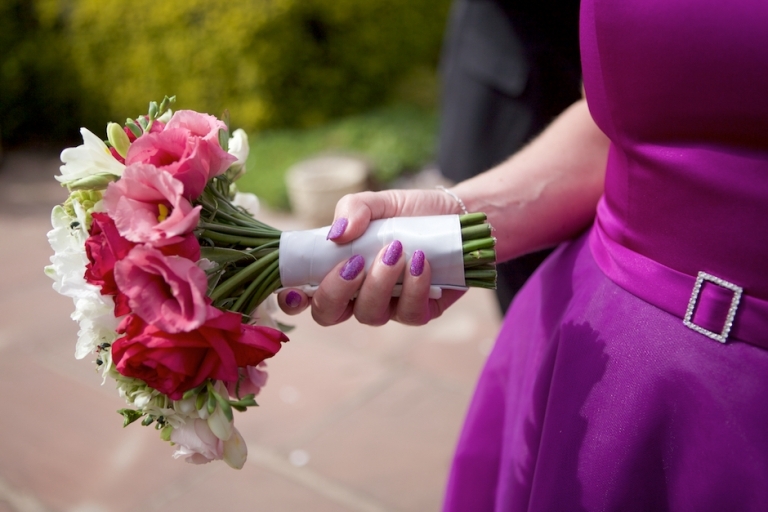 Brides spend hours choosing their flowers and colours, meeting with florists and discussing with friends and family. Here are some wedding flower bouquet ideas, along with some lace details taken from dresses. All the images are those taken by myself over five years of capturing weddings. The wedding bouquet is an important part of your whole look, from the simple tiny hand bouquet of dainty flowers tied with lace to the larger drop tear, carefully wired. It all comes down to personal preference, I think it’s important for your flowers to suit your personality and for you to love them. Choose your florist well, recommendation is often best, talk to them about your ideas and listen to theirs. I always recommend Sarah from ‘Rose of the Shires’, you can call her on 07730 397459. 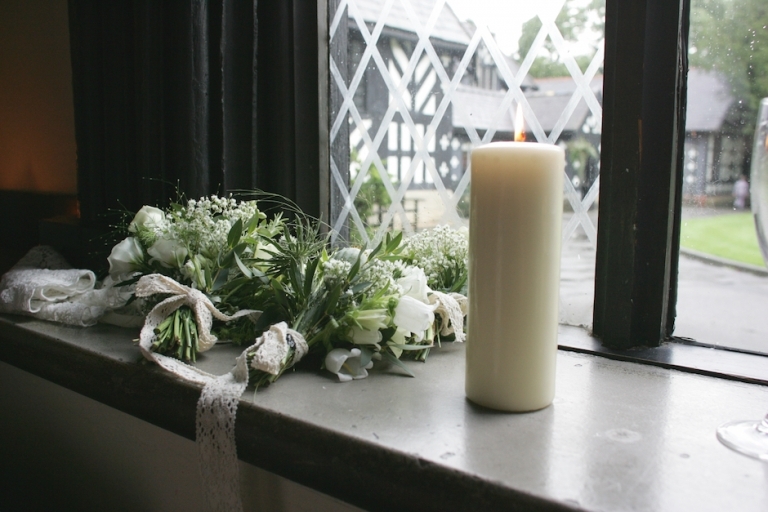 Seasonal flowers work best, Spring weddings are gorgeous and the sight of bluebells, tulips and other Spring flowers always brighten a bouquet and table. Sunflowers are always popular for later Summer weddings. Roses undoubtably are the most popular, a simple bouquet of white roses is often seen at weddings. 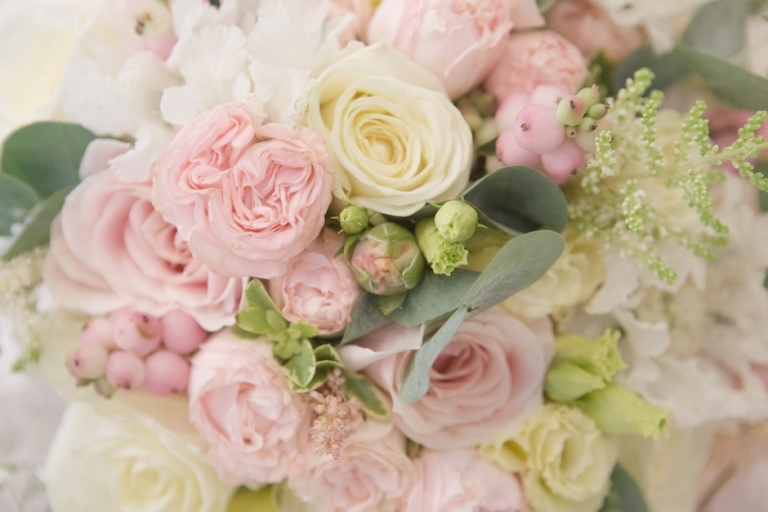 My personal favourite is a looser selection of roses, peonies with beautiful greenery. 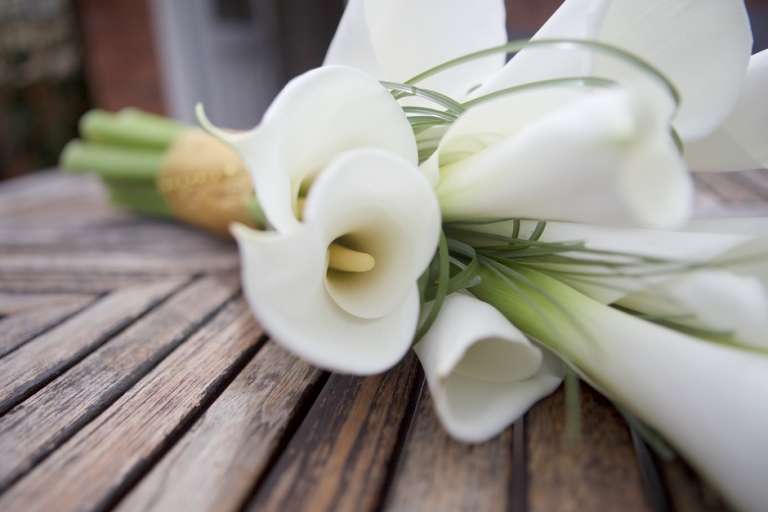 Brides often choose to include a favourite flower of her grandmother or mother. Seasonal flowers are often more reasonable and make a huge difference in your budget. 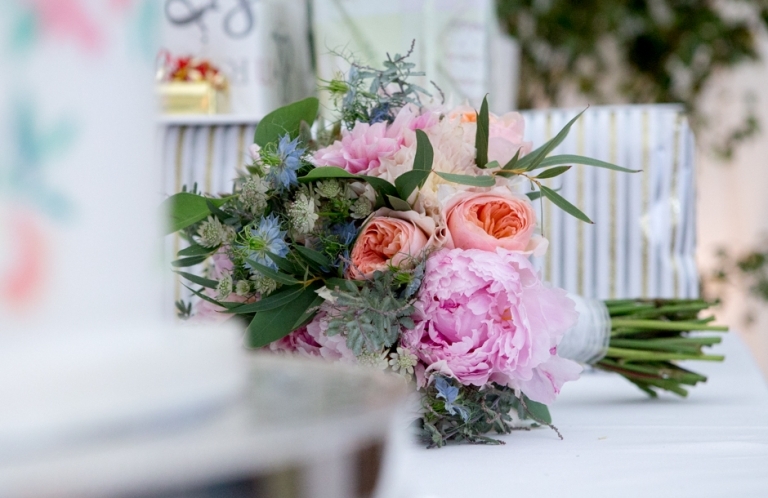 Tying flowers make your bouquet individual, as often it lays on a table throughout the day. Lace, ribbon and hessian being most popular. 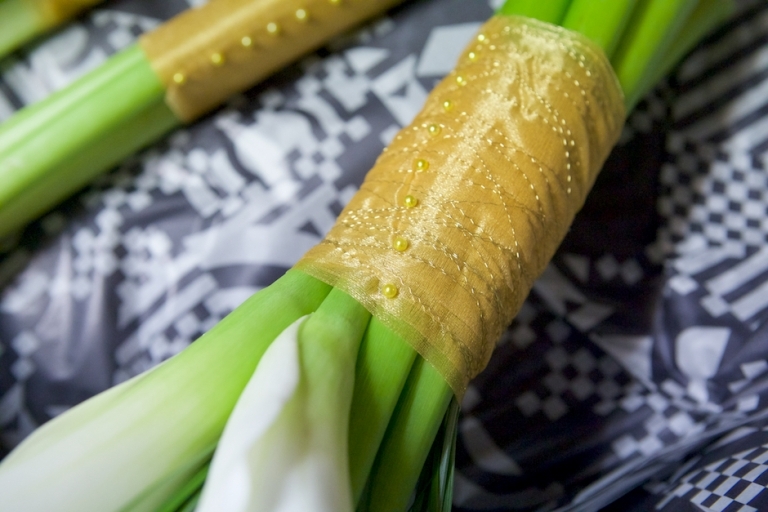 A favourite of mine was a stunning contemporary lily bouquet, left very long with ribbon, wire and pins adorning the stems. This worked very well with the brides very simple silk dress. Table and church flowers can be expensive, using the church flowers at the reception is a great idea, pew flowers can be used to hang up at the reception too and at one wedding the bride had put out seven vases on the sweet table, the middle one for her bouquet and the others for the bridesmaids’ bouquets. This made for a beautiful display. Whether having a long, or round top table the flowers to work with the room. If it is very high ceilinged a taller display works well. Ensure they aren’t at face height, especially for the speeches. Plants work well on tables, especially sculptural ones, Succulents are popular and these can be given to guests afterwards. A favourite of mine is a selection of vases, bottles and containers wrapped in lace with simple Spring/Summer flowers in. These can be bought and arranged yourself. Herb pots are also beautiful. There is a wonderful company in Oxfordshire called Green and Gorgeous which grows all its own flowers, working with the seasons to grow a large variety of old English favourites through to the wild and unexpected. 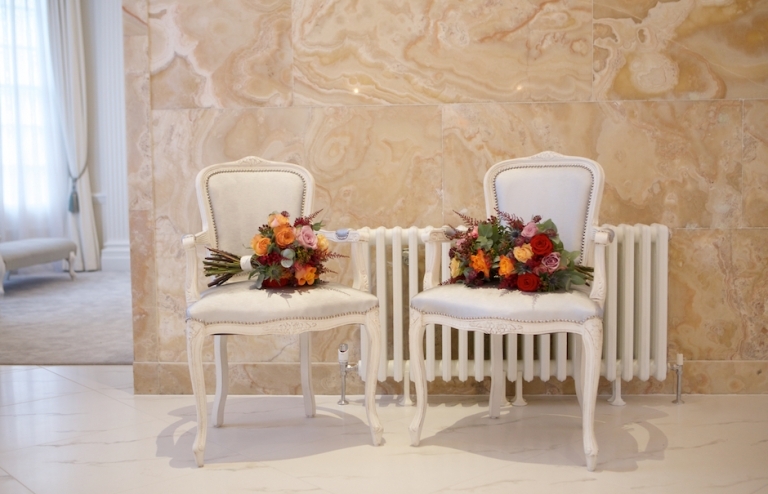 You can visit and choose your own selection, they then arrive on the day and decorate the church/ceremony room and reception for you. When your flowers arrive make sure you drain and wipe them. Carry them with confidence and enjoy every minute of your day. 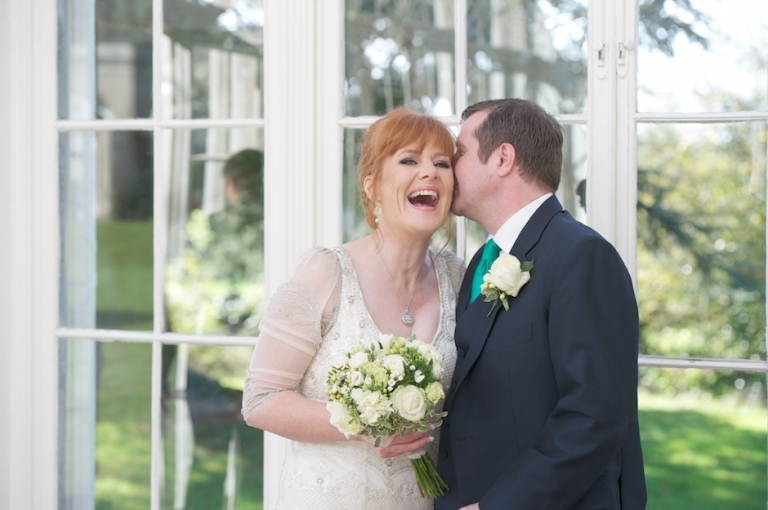 Call me on 07929 978493 to chat about your wedding photography. Prices start from £500 for short coverage, local, weekday weddings.